Many cannabis laws around the United States allow you to grow cannabis in your own home. While each state has their own regulations, the process of growing marijuana is universal. Sure, depending on the cannabis strain, the specifics on how to grow it will be unique. However, the nuts and bolts of getting started are fundamentally the same. So, if you’re new to growing, or looking for a refresher, keep reading to learn how to start growing weed indoors, how to plan your grow room, get your equipment and pick out seeds. This isn't going to teach you how to grow, but rather how to set up your grow room to get started. The first step in growing weed indoors is a crucial one. You need to pick an area that can foster your cannabis plants. When people think of a grow room, they imagine a huge open area with lights and plants everywhere. This isn't Showtime, and you're not on Weeds. A grow space can be anywhere from a cabinet to a closet to a grow tent. You just need an area big enough to fit the equipment, and that can hold the number of plants you intend on growing. While you won’t need a master bedroom to play host for your first grow room, you do have to keep in mind what goes into the area. In your grow room, there needs to be room for lights, fans and ducting, plus the plants. You don't want the area to be too confined and you will need a decent amount of headroom. As cannabis plants flower, they can almost triple in size! Plus, the strain partially determines the amount of space the plant will take up. If you were planning on using a cabinet or small closet to grow your weed indoors, read up to make sure it's a good strain for it. These are little things to keep in mind, especially if you want to grow your plants conspicuously. To help you decide the size of your growing area, read this guide on how much space you need per plant. Before you bring any plants into your grow space, be sure to sanitize every surface. This isn’t a one-and-done job. Marijuana is susceptible to disease, and you must routinely clean your grow room. Just be sure your grow room has a surface that is easy to clean. With that in mind, you will want to avoid materials that soak up water and odors such as carpets, raw wood and heavy drapery. You must also ensure that the grow space you choose can remain light-tight. If any light sneaks into the grow room during an intended dark period, then it will alter the genetic makeup of your plant. This unforeseen stress during the flowering phase can cause your plants to become hermaphrodites—both a female and a male. Hot and humid weather can be disastrous for your grow. Growing plants in this kind of environment can be a breeding ground for mold and other diseases. With this in mind, you want to choose an area that is cool and dry. If the room has access to fresh air that you can introduce directly from the outdoors, that is a best-case scenario. If not, you will have to shape the perfect environment with CO2 generators, fans, air conditions, humidifiers or whatever else it takes to achieve an optimal environment. Remember to Leave Room to Work! Tending to marijuana plants can be a lot of work. Therefore, keep your needs in mind when planning out a grow room. You will be cleaning, trimming and watering your plants. Not to mention, the beginning stages of growing marijuana requires monitoring multiple times a day. For your own peace of mind, you will want a grow room that’s easy to access. If your grow room is a small area, you need to ensure that getting the plants in and out for maintenance won’t be an issue and that the plant won’t get harmed in the process. It’s easy to get caught up in the excitement of creating a grow room, but be realistic. Even the greenest of thumbs will experience some setbacks. Growing cannabis takes a bit more care than your average plant, so it’s easy to lose your cannabis to disease or pests. So, pick an area that’s not too big and plan for not too many plants. Monitoring fewer plants as you learn how to grow indoors is a lot more helpful for educational purposes as well as the health of the plants. Not to mention, the fewer plants you have, the less money you need to fork over for equipment. After choosing a grow room, the next most important step in growing weed indoors is picking your grow lights. Seeing as your cannabis is living in a cool, dry, dark area, having quality light during “daytime” periods is essential for the health of your plant. There are many types of grow lights, so let’s take a look at the most popular ones. These are the cannabis industry standard because they are highly efficient at a decent price point. While they do cost more than their fluorescent and incandescent counterparts, they output more light per unit of electricity, making them more cost-efficient in the long haul. For a proper HID light setup, you will need both a ballast and a hood/reflector to go onto each lamp. If you’re on a budget and can only afford one HID light, go with the HPS as it delivers more light per watt to the plant. HID lights get very hot. Therefore, you will need to mount your lamps in air-cooled reflector hoods. Using this setup means you must get exhaust fans and ducting for your grow room as well. These are an ideal setup for those who are very new to growing indoors and are unsure if they’ll continue the process. Fluorescent light fixtures come with a reflector, ballast, and bulbs. Also, fluorescents don’t generate as much heat, so there is no need for any cooling systems. While fluorescent lights are cheaper out of the pocket, they are less efficient than HID lights, producing 20 to 30% less light per electricity watt used. This is the most efficient, but most expensive option. However, you get what you pay for with LED lights—and they end up paying for themselves. LED grow lights last longer, draw less electricity and generate a minimal amount of heat. All of this leads to bigger yields of cannabis. Just do your due diligence as many cheap, less-effective LED lights are starting to infiltrate the market. With your grow room and lights intact, you now need to control your environment. Plants need air and carbon dioxide to survive. Place an exhaust fan at the top of the room to remove hot air. Then put a filtered air inlet some on the opposite of the room on the floor. While temperature varies by plant when the lights are on you want to remain in the range of 70 degrees F and 85 degrees F.
When the lights are off, the room should stay within 58 degrees F and 70 degrees F.
To maintain this accuracy, you can invest in an expensive climate control unit. However, you can also set a 24-hour timer for the light and use an adjustable thermostat on the exhaust fan. Now you need to determine how you are going to grow your pot. You can go the old-fashioned route and get soil. Use high-quality potting soil free from inorganic fertilizers (looking at you, Miracle-Gro). There are many soils on the market with organic material formulated for optimal cannabis growth. Otherwise, you can try hydroponics. Mineral salt nutrients derived from organic materials such as a clay pebbles, rockwool, and perlite are absorbed by the cannabis roots. There are many expensive and complex hydroponic systems out there, so this might not be the best growing medium for beginners. No matter what, you are going to need to give your plants additional nutrients the soil can’t provide. You need to make sure your plant has adequate drainage because cannabis is very prone to water-logged diseases. For hydroponic systems, you can use small net pots that contain the organic materials that the cannabis route soak in. When dealing with soil, many first time growers use five-gallon buckets with holes drilled on the bottom. Click here if you want to look through a complete guide on how to choose your pot sizes. Now that you have your equipment, you just need your seeds. First, you need to decide whether you want to grow indica (relaxing feeling) or sativa (upbeat feeling) plants. From there, make sure that these seeds can thrive in the environment your grow room is equipped for. Make sure your seeds are hard and dark brown with spots. Avoid seeds that pale, green, or cracked at all costs. Whenever you buy seeds, most packages are 50% male and 50% female. Females are the ones that flower into marijuana. So, to increase your chances of getting a big yield, get feminized seeds. This will up your chances of growing a female plant to 95%! 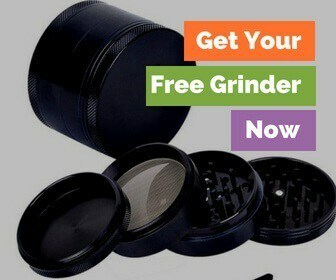 If you choose to buy seeds online, we recommend that you go through ilovegrowingmarijuana.com. They offer female, autoflower and mixed bags of seeds. Not to mention they guarantee their seeds will sprout. 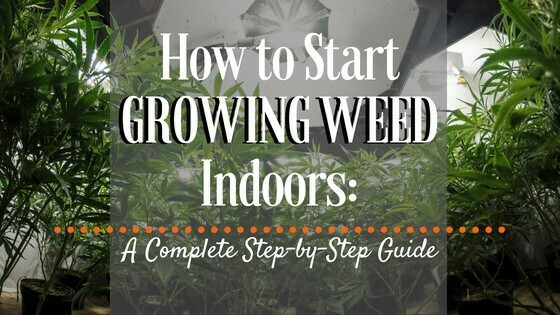 When you start researching how to start growing weed indoors, you might feel lost. Our hope is that this guide at least pushes you in the right direction. Well, did you take the plunge and start your first indoor grow? We would love to hear how it turned out!